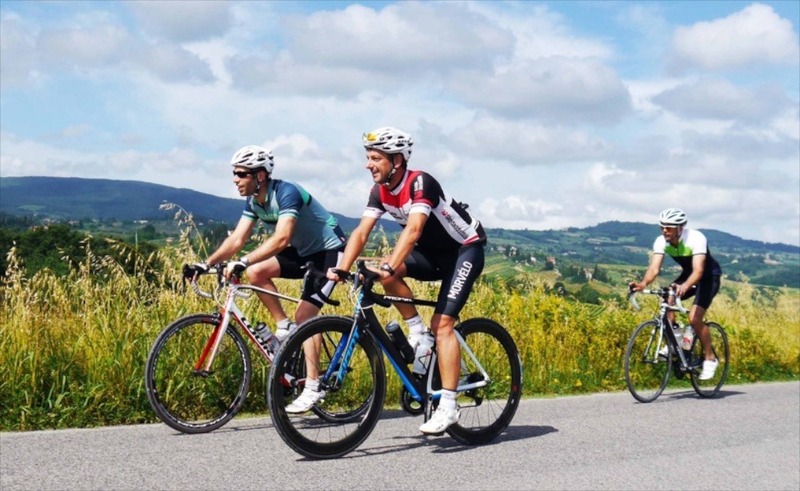 An easy paced road cycling holiday in Italy explores one of the country's premier cycling locations. Tuscany - the word itself is evocative, conjuring images of classic Italian landscapes, rolling hills, cypress trees and medieval hill-top towns. The region also offers superb cycling and is an international training ground, attracting riders from all over the world. Cycling is a way of life here and is taken seriously. We spend our first evening in the charming medieval town of Casciana Terme, a spa town retreat scattered with great restaurants and superb gelateria. The following morning we head south through the olive groves to the atmospheric twin-castled hilltop town of Volterra. Moving onwards we ride into the Parco Della Val d’Orcia, a World Heritage site with a distinctive landscape of conical hills rising from the flat chalk plains. Wine-lovers will be in their element as the tour progresses and we’ll be spending evenings in both Montalcino and Chianti where we will set time aside for a glass or two of Brunello and Classico. Travelling north again through the land which lies between Siena and Florence we head for San Gimignano, a fascinating “town of towers” and one of the best preserved medieval settlements in Italy. We’ll stay here for the evening before our final day on the bikes takes us back to Casciana Terme in good time to take advantage of the town's soothing thermal waters. Simply fill out the form below and we'll send them right over. We'll remember your details during this session, so you can easily download more holiday trip notes - soon you'll be exploring on two wheels. How do you fancy receiving our trip notes? Select one or more. A member of the lovely Skedaddle Italia team may use the information you provide to get in touch, say hello and answer any questions you might have. They've got insider knowledge on upcoming departures, travel arrangements and other information to make planning your trip as easy as possible - no hard-sell, we promise! If you'd like to opt out of receiving newsletters in the future, please tick this box. Please note, if you already have an account with us, ticking this box will remove all of your current newsletter subscriptions; you can update your preferences anytime in your account. Where would you like us to send this to? Would you like to set up an account? Setting up an account will help you fill in forms more quickly in future. It will also give you access to enhanced features on our site. Yes please, I would you like to set up an account now. All email marketing communications from Skedaddle will come with the option to unsubscribe and you can also manage your subscription preferences by logging in to the My Account area of our website. The post Design your dream cycling holiday appeared first on Skedaddle Blog. Please enter the email address you've registered with us and we'll send you instructions on how to reset your password. Please call us on +39 3405730355 to check availability on your preferred date. Would you like to book this holiday?